INCOalliance is attending FOSDEM on February-2019. This is the place where a lot of activities are hosted and it gives a chance to get a deeper glance to the public tech events which are taking place in Belgium this Winter. In particular, there will be 62 tracks, 748 events and 715 speakers – and all these are making FOSDEM a very busy event. It will be held in 33 rooms which are located in separate buildings of the Solbosch campus of the ULB (Université Libre de Bruxelles). The basic overview of the event is available on the main website. INCOalliance will send the participants into developer rooms and main tracks. As well, we wish good luck to Keynote speakers and those who will be busy with certification exams. During the event, the organizers are planning to hold the live streaming which will be updated every few minutes to make the feeling of what is going on in each room. At INCOalliance, we are passionate about several rooms connected with Go and Graph Processing and .NET. If taking a deeper look to the topics – they may show that Europe is also passionate about latest technologies and Golang. This would be great to hear about the expertise in .NET and microservices from EU perspective. 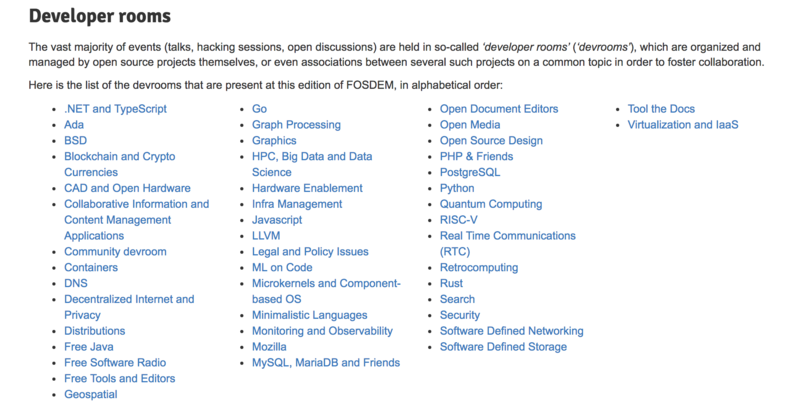 FOSDEM arranged a great list of speakers and they will share both technical and basic topics. We are sure that the Open Source realm will attract a lot of interesting personalities there. But the best part of FOSDEM is in its completely free attendance. This is non-commercial event initialized by the community. And this is high-level tech event for those who are highly interested in the open-source solutions. Let’s meet in Brussels this winter and get more information about the latest developments in open source software. We also use this information for analytics.